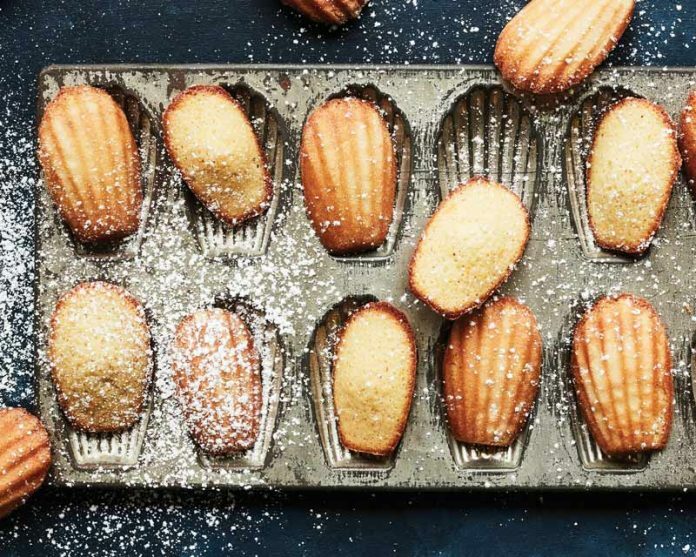 When blogger, Rebecca Firth, lived in Beijing, her family would often go to Maison Boulud, where the bartenders served up madeleines with cocktails. This recipe from Rebecca reminds her of that beautiful, now-defunct bar. 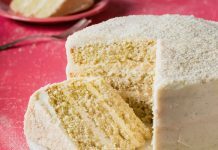 Instead of the traditional melted butter, she uses softened butter for extra lift and a cake-like texture. You’ll know your butter is perfectly softened when it’s easily smeared on a plate. Find more recipes with Chinese Five-Spice in our November/December 2017 issue! Preheat oven to 400°F (200°C). Butter and flour 20 madeleine pan wells. Freeze for at least 5 minutes. In the bowl of a stand mixer fitted with the paddle attachment, beat sugar mixture and eggs at high speed until pale yellow and thick, about 5 minutes. With mixer on low speed, add milk and vanilla; beat for 1 minute. Place about 1 tablespoon batter in each prepared madeleine well. (They should be between halfway and three-fourths full. Place batter in deep end of each well, not the middle. Do not smooth or flatten.) Place madeleine pans back in freezer for 5 minutes. Move directly from freezer to center of oven. Bake for 8 minutes. Rotate pans, and bake until golden around the edges and puffed up in the middle, 3 to 4 minutes more. Let cool in pans for 1 minute. Remove from pans, and let cool completely on wire racks. 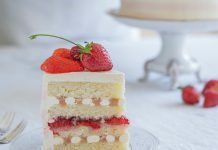 Sift with confectioners’ sugar. Dip top edge of each cookie in Five-Spice Pomegranate Glaze. 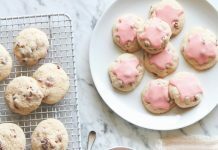 These cookies are best eaten the day they are baked. In a small bowl, whisk together confectioners’ sugar, pomegranate juice, and five-spice powder. Add milk to thin, if necessary.